Edward MacPherson Man was born on 20 March 1888 at 1020 31st Street, Denver, Arapahoe Co., Colorado, USA, the son of James Henry and Sarah Francis (Huntley) Man, and was baptized 24 June at Trinity Memorial Church, Denver. He married Alberta Coad on 1 April 1915 at Norwood, Delaware Co., Pennsylvania, USA. Edward died on 30 April 1962 at 25 Aiken Street in Norwalk, Fairfield Co., Connecticut, USA, and was buried on 2 May at Riverside Cemetery, Norwalk. Alberta Coad was born on 27 September 1884 in Worsthorne, Lancashire. She died on 30 December 1976 at the Olney Nursing Home, Olney, Montgomery Co., Maryland, USA, and was buried on 5 January 1977 at Riverside Cemetery, Norwalk, beside her late husband. Edward and Alberta first met on the Cedric and were married two years later. Note the error in Edward’s name, he is recorded as just ‘Edward MacPherson’. Man Family Reunion Party, July 4, 1959. Hosted by Edward M. Man and Alberta C. Man at Howard Hotel, Friargate, Derby. Standing along back row from left to right are: (The relationships spelled out below are in terms of Edward M. Man – “The Principal”) John William Cowper Man (great nephew); James Edward Reginald Cowper Man (nephew); Gordon Huntley Man (great nephew); Edna Noel Toon Man (Gordon’s wife); John Horace Cowper Man (nephew); Margaret Dawson Lewis (1st cousin); Michael Lewis (1st cousin, twice moved); Henry Lewis (Margaret’s husband); Brian Priestley (Jane Florence Man’s husband); Harold Dale (Marion’s husband); Donald Taylor (nephew); Mr. Nurse of Jamaica (friend of Dales). Ladies seated in the front on the floor: Margaret Lewis Ely (2nd cousin); Florence Avery (1st cousin once removed); Jane Florence Man Priestly (great neice); Constance Smith Lewis (mother of Michael); Barbara Nurse (of Jamaica fid of Dales). Note the picture is composed of both the Man and Huntley families. Edward’s mother being a Huntley. 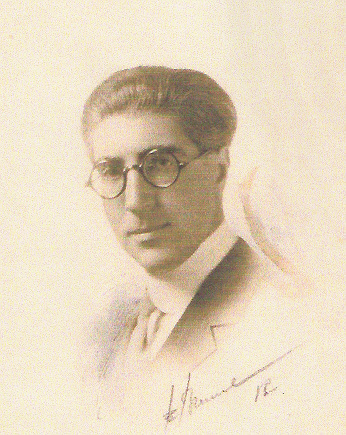 Those with the name Lewis are Huntley descendants. The following notes on the life of Edward MacPherson Man where made by his son Ed Man. Edward MacPherson Man 1888-1962 EDWARD is a family name his grandfather’s name was Edward; his great-grandfather was an Edward; one of his uncles was an Edward. MACPHERSON Louisa Emily Huntley, his mother’s sister, had gone to British Guiana with his mother and father, Sarah Frances Huntley and James Henry Man, presumably to help her sister take care of her two infant sons. Louisa met and, subsequently, married John MacPherson Dawson, a Scot manager of a sugar plantation in British Guiana, and the brothers-in-law became fast friends. Edward was born to James Henry and Sarah in Denver, Colorado, USA, on March 20, 1888. He was their fifth child (two boys having been born in England, two girls having been born in British Guiana). James and family had gone to Colorado in about 1884 after James had been diagnosed as having `consumption’ [tuberculosis of the lungs] and was advised to move to a dry, high climate. It is not known why Colorado was selected. A letter to the Colorado vital records office in Denver requesting a birth certificate solicited the response that this time period (ca. 1888) was before statewide registration and recording at the county level was spotty. An inquiry to the Colorado Historical Society was also fruitless. They reported that the absence of a birth notice in the local paper at that time was not at all unusual since a fee had to be paid to get the event listed and the Mans being newcomers in the area, there really was not much point to advertising the event. Since I had my father’s original baptismal certificate, I looked for the church only to find it was no longer in existence. On the advice of the local (Bloomington, Indiana) Episcopal Church office, I then wrote to the Episcopal Diocese of Colorado in 1995 and two months later received a reply from the Diocesan archivist in which he provided me with information from Register #2 of the Trinity Memorial Church, Denver. On pages 162-163 – Baptisms, Entry No. 318 – not only the date and location of the baptism were given, but also the date of birth. 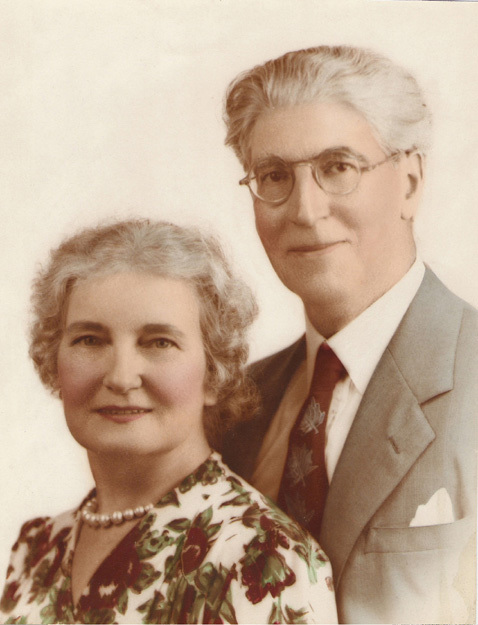 It is interesting to note that two of the sponsors at the baptism were Arthur Hendry (founder and, at that time, vice president of the Hendy & Meyer Engineering Co. where my grandfather worked) and his wife, Elizabeth F. Hendry. Edward’s father dying on May 21, 1888, left his widowed mother, Sarah, with five children ranging in age from 13 years to two months old. She had little choice but to pick up her young family and return to England, which she did in July 1888 according to the same church register, page 256 – Communicants Revised List of 1887, Entry No. 79. My father, apparently, learned the trade of lace designing and draughting [English spelling] for a passenger list for the `S.S. Haverford’ sailing from Liverpool on May 20, 1911, shows Edward along with four other lace draughtmen from Derby arriving on June 5 at Philadelphia sponsored by the North American Lace Works of Philadelphia. 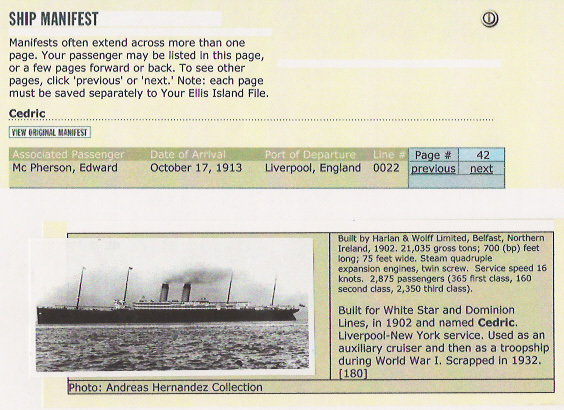 The next record found was from a UK incoming passenger list showing Edward Man coming from New York City aboard the `Celtic’ arriving at Liverpool on July 5, 1913. Since he next shows up on the manifest of United States citizens sailing from Liverpool on the October 9, 1913, on the `Cedric’ arriving at New York City on October 17, 1913, I assume that he had gone home to tell his mother that he believed his future lay in the States. Sailing on the same ship with her cousin, Charles E. Rowe, of Plymouth, Pennsylvania, was Alberta Coad from Burnley, Lancaster, who was going to visit her mother’s sister, Mrs. James Rowe of Plymouth. 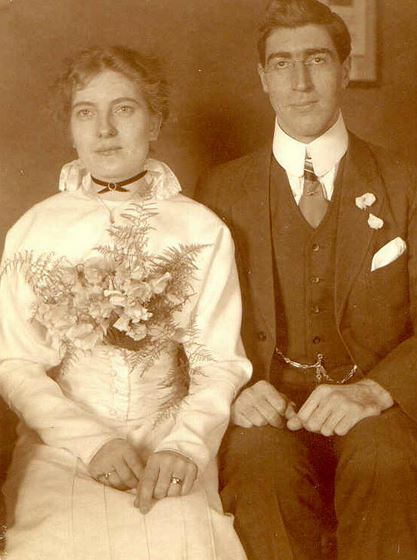 A shipboard romance ensued and Edward and Alberta married on April 1, 1915, at Norwood, Philadelphia County, Pennsylvania. Her bridesmaid was another cousin, Clara Rowe. Maxwell and Emma Rowe Carrington were witnesses. Philadelphia city directories show Edward living at a number of places between 1912 and 1919. In this period of time it is known that my mother suffered two miscarriages and a stay in a tuberculosis sanatorium in the Adirondack region of New York State. By 1915 Edward was shown as being a salesman and by the time he filled out a World War I draft registration form in June 1917 at Caldwell, New Jersey, he was shown as unemployed. In 1919 he applied for a passport for his wife and self to sail to England because of the illness of his mother and to help arrange her estate. Once more they sailed on the `S.S. Haverford’ from Philadelphia from New York City arriving in Liverpool on August 21, 1919. They returned to the States on the same ship on November 12, 1902, arriving at Philadelphia on December 8. (This explained why I could not find them in the 1920 US census). I am aware that my parents lived for a while with a family named Barks in Frankford, Philadelphia. By 1923 they were living in an apartment in the home of a family named Jenkins at 5029 Morris St., Germantown, Phila. I was born at this time. Future residences were 4906 Pulaski Ave., Germantown, where my sister was born, and then around the corner to 327 West Logan St. They remained on Logan Street until 1951. During this time period my Dad worked for the Bromley Lace Works Co. until they shut down in the 1930s. He then worked as a freelance lace designer and draftsman from home. The hours were long and they came to a sudden end when the country went to war in 1941. Through the aid of Edward Deming, a vice-president of the Philco Co. in Philadelphia, and Sunday School superintendent at the M.E. Church of the Advocate where we went to church, Edward was able to get a job as an inspector at Philco’s ordnance department where (secretly) proximity fuses were being manufactured. Of course, with the conclusion of this war this job no longer existed and he went back to freelance lace designing. One of the companies he did work for on this basis finally offered him a job in Norwalk – the Connecticut Lace Works – and in 1951 my parents moved to Norwalk after 36 years in Philadelphia. Edward remained in Norwalk until his death in 1962. My parents were able to take two more trips back to England. 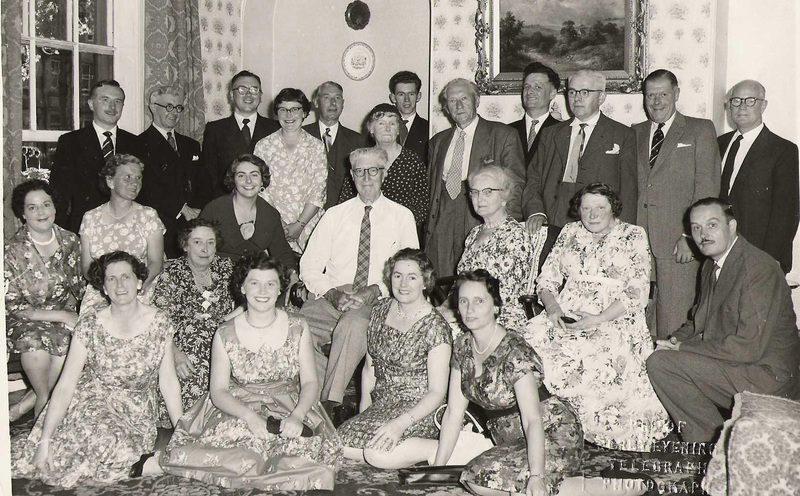 In 1956 they made a three-month trip back to England visiting both Edward’s relatives in Derby and Alberta’s relatives in Burnley, Lancashire. They sailed on the `Britannic’ from New York City arriving in Liverpool on August 17. There return trip was again on the `Britannic’ leaving from Liverpool and arriving back in New York City on October 27. They made the trip once more in 1959, again sailing on the `Brittanic’ from New York City and arriving in Liverpool on May 22. On this visit they hosted a MAN Family Reunion at the Howard Hotel, Fairgate, Derby, on July 4. There were 24 people present from both the Man side of the family and the Huntley side. The event merited a photo of the gathering on the front page of the Derby Evening Telegraph. There return trip was again made on the `Brittanic’ leaving the Port of Liverpool on August 21 bound for New York City. Edward died at his home in Norwalk on April 30, 1962, after a long battle with cancer and was buried at the Riverside Cemetery in Norwalk. My mother was also buried there after her death in 1976. During his life, Edward was an ardent tennis fan. There was a small tennis club ‘Morris Field Club’ in the center of the block bounded by Logan St., Morris St., Seymour St. and Pulaski Ave. (note that the streets were all named for Revolutionary War generals – fitting for Germantown where battles were fought at that time). One had to use the alleyway behind Logan St. to get to the courts and the gate was opposite our backyard. Edward was not only an active player, but he took care of the courts, strung racquets and sold tennis balls. He eventually became president of the club. His church interests centered on the Men’s Bible Class at the Methodist Episcopal Church of the Advocate in Germantown. He, again, became president of this group and almost single-handed built the class from a handful to having over 30 men attending every Sunday. The teacher was a Dr. George Tyson – a neighbor living on Morris St. and another tennis player. He was a professor of Psychology at Ursinus College in Collegeville, Pennsylvania, and commuted each day to the school. I have two photos of minstrel shows given by the Bible class to raise money for the church. These are from the early 30s. It is hard to imagine in this day and age that a Christian church would have no qualms about being involved with such a thing, but in those days it was not uncommon. I, also, have a photo of a show given in 1936 called the ‘Womenless Marriage’ in which the men of the Bible class dressed in all sorts of outlandish costumes. Lastly, I have a poised photo of the Men’s Christian Forum, as it became known, taken in 1943. Edward also liked playing bridge, but I do not recall any specific details about that. When Edward and Alberta moved to Norwalk, his interests were more with the garden surrounding their cottage, which was the first detached house they had ever lived in. He also became interested in the men’s organization at the local Y.M.C.A. Not surprisingly, he became president of that organization, too. I have a very nice framed plaque that the group gave Dad on his retirement from the group shortly before his death. I’ll certainly say this for him, when he got interested in something, he gave his all to the cause (much to my Mom’s chagrin, at times).